Maurits Cornelis Escher (1898-1972), the great Dutch engraver, belongs to that special category of artists known to the general public not so much by name, but rather for their captivating creations. We may not remember who was responsible for masterpieces such Metamorphosis II (my favorite, I'd be hours watching), Hand with Reflecting Sphere and Day and Night, which can all be found in this exhibition, but we have worn them on t-shirts, or admired them on posters on our bedroom walls as children. This exhibition aims to explain how this intellectual came to create these extraordinary works, which even for our generation, long accustomed to the sophisticated graphics found on computers and websites, still have the capacity to amaze. 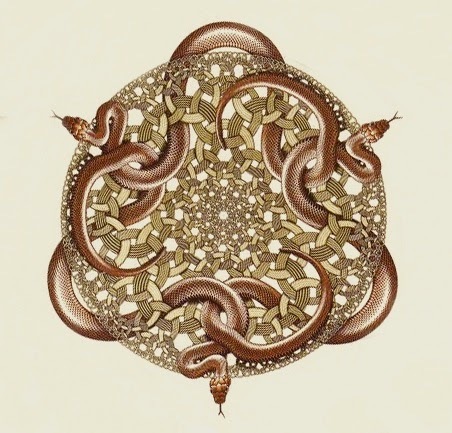 The starting point for all of Escher's work is his ability to observe nature in a different way, with a different viewpoint, adopting an outlook that gave him a clear insight into the beauty inherent in the geometrical regularity of the world, which can be magical and playful at times. It is no coincidence that Escher's attraction to the extraordinary and unusual first took root in his heart and mind as a result of his amazement at the beauty Italian landscape. It was this acquaintance with a new form of nature, coming as he did from the gentle flatness of the Netherlands, which inspired him to search for the secrets of the tessellation of the geometric plane. The challenge was to use a continually repeated module to fill a surface completely, without leaving any gaps, like the squares on a chessboard. However, if you replace this shape with an illustration of a small man, knight or crocodile, for instance, you enter the boundless world of Escher, where imagination plays with geometry and crystallography.